Silversea Cruise Line: Information on Silversea Cruises, cruise destination, cruise fleet, cruise discounts All suite cruise ship. 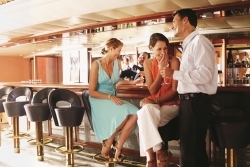 Silversea Cruises offers you a delightful choice of eight luxuriously appointed ships. The cruise ships Silver Spirit, Silver Shadow, Silver Whisper, Silver Wind, Silver Cloud, Silver Galapagos, Silver Discoverer, and the Silver Explorer will allow you to cruise the four corners of the world nestled in the lap of luxury. As you decide how to spend your magical time cruising aboard these spacious, perfectly sized cruise ships, the staff is eager to turn your cruise ship from dreams into reality. Silversea Cruises is world renowned for its exceptional service, luxuriously appointed suites and Relais and Chateau menus for fine dining. It is no wonder that Silversea Cruises is the undisputed leader in luxury travel for the last 17 years. With the All -Inclusive fares, there is all the more reason to make Silversea Cruises your next adventure. "The owners and staff of Atlantis International want to congratulate Kenny Wong for his excellence in the travel industry and for being invited to participate in the March 25, 2014 christening ceremony of Silversea's newest ship, the Silver Discoverer! Well done Kenny!" Each Suite is not only beautiful, but well thought out, and offers one of the highest space per guest ratios at sea. You can personalize your suite with a myriad of beautiful options from luxurious toiletries and personal stationary to a well stocked bar of your personal favorites. With Egyptian cotton lines and a choice of nine pillow types you can further feather your nest. Butler service in every suite adds to the carefree lifestyle of the Silversea guest. All you have to do is enjoy! Dining aboard these gems of the sea is an experience not to be missed. 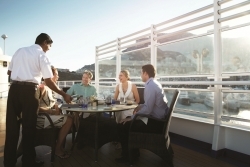 Fine dining is a hallmark of Silversea Cruises, and they never disappoint. The Restaurant sparkles with fine china, crystal and candlelight and serves an elegant contemporary cuisine with flare. Open seating allows you to dine whenever and with whomever you please. No need to rush your pre dinner cocktails with your new found friends. Enjoy the moment and enjoy your dinner. Additional guests are always made welcome. LaTerrazza is another wonderful dining option. By day, a sumptuous breakfast and lunch is served. Dine indoors or al fresco. In the evening, some of Italy's finest cuisine is served as a dinner alternative. The freshest ingredients are paired with delightfully authentic recipes to pamper your palate. An Italian tratoria with an ocean view table. Bliss!! Should you find yourself looking for "something different", choices abound. La Champagne is the only Relais & Chateaux restaurant at sea and the menu varies with your destination. This is true indulgence with a regional twist, and a very memorable evening. The Stars Supper Club and the Asian inspired Seishin restaurants on the Silver Spirit offer even more alternatives for your dining pleasure. Be sure not to miss the finest Asian fusion cuisine at sea,along with Sake pairings, or spend the evening in the Rainbow Room inspired Supper Club, munching on the beautiful small plates while being entertained in the Jazzy mood. To further enhance your sailing adventure the Silver Perspectives Program includes lectures, informal talks and demonstrations to enrich your understanding of the lands you visit, and the people who live there. Famous guest speakers, noted historians, celebrity chefs, bestselling authors and world affairs experts share their knowledge and perspective on the areas of their expertise. Sea days are some of the best days of a cruise, and Silversea makes sure that you are never at a loss for something interesting to do. Should you decide that daydreaming on the deck is not for you, there are many options to choose from. The world class spa and fitness center is always available to either pamper your cares away, or exercise classes to help you reach those fitness goals. 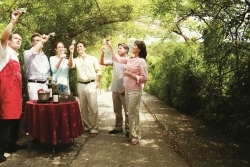 You can brush up on your Golf putting, go to a wine tasting, play Bridge, or enjoy a high tea. The Silversea team knows that by choosing Silversea Cruises you have the highest expectations, and they truly delight in exceeding them. Come aboard and experience La Dolce Vita!